Increasingly, writing handbooks are seen as over-produced and overpriced. 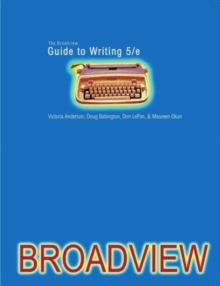 One stands out: The Broadview Guide to Writing is published in an elegant but simple format, and sells for roughly half the price of its fancier-looking competitors. That does not change with the new edition; what does change and stay up-to-date is the book's contents. For the sixth edition the coverage of APA, Chicago, and CSE styles of documentation has been substantially expanded; the MLA section has now been fully revised to take into account all the 2016 changes. Also expanded is coverage of academic argument; of writing and critical thinking; of writing about literature, of paragraphing; of how to integrate quoted material into one's own work; of balance and parallelism; and of issues of gender, race, religion etc. in writing. 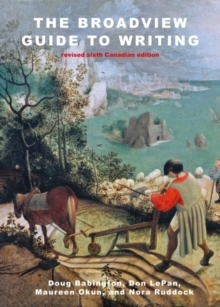 The chapter "Seeing and Meaning: Reading (and Writing About) Visual Images" is entirely new to the sixth edition.|Increasingly, writing handbooks are seen as over-produced and overpriced. Also expanded is coverage of academic argument; of writing and critical thinking; of writing about literature, of paragraphing; of how to integrate quoted material into one's own work; of balance and parallelism; and of issues of gender, race, religion etc. in writing. 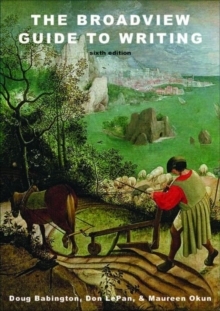 The chapter "Seeing and Meaning: Reading (and Writing About) Visual Images" is entirely new to the sixth edition.